All My Sons tells the story of Joe Keller, a successful, middle-aged, self-made man who has done a terrible and tragic thing: during World War II, rushing to meet an order from the Army, he knowingly sold them defective airplane parts which later caused the planes to crash and killed 21 men. He framed his business partner for this crime and engineered his own exoneration; now, his son is about to marry the partner's daughter, the affair is revisited, and his lie of a life is unraveled. 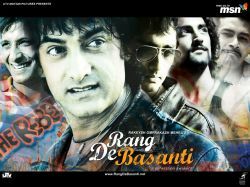 Rang De Basanti has a similar plot line in which Rajnath Singhania sold defective airplane parts to IAF MiG planes. It crashes and kills one of his sons' friend's fiancé, who was piloting the plane. But in order to save himself he blames the crash to the pilot. A movie that give the color of patriotism a new taste. A very well executed movie with a concept of blending the past and present is simply brilliant. A must see movie for each and every Indian. The movie is about the corruption in India and the fight against it, just like it was done at the time of struggle of Independence.